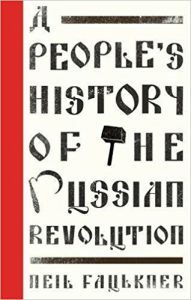 A People’s History of the Russian Revolution is one of a spate of books published for the centenary of the Russia Revolution. It aims to provide an accessible guide to the Russian Revolution drawing out lessons for activists today, to counter the common myths about the revolution, and to be an intervention within debates about Bolshevism and Leninism. The book proceeds in chronological order, and is broken down into themes such as the Tsarist regime, the revolutionaries and the impact of the First World War. The style works well, as it gives a concise summary of the long background to the revolution from Ivan the Terrible (1533-84) to the brutal 300-year reign of the Romanovs, starting with the proclamation of Michael Romanov as Czar in 1613. The reader gets a sense of the brutality, nationalism and anti-Semitism of the Tsarist regime, and the hybrid nature of Russia’s economy. By 1914 the Russian economy combined a highly advanced industry, which created a heavily concentrated working class, with peasant farming based on techniques that had not changed in hundreds of years. This was an example of what Leon Trotsky described as ‘combined and uneven development’. A small downside to this part of the book is the uncritical use of the term ‘Asiatic despotism’ (13) to describe Russia. Marx (and Marxists after him) did frequently described Russia in this way. However, Marx seems to have moved away from this term via the ‘Asiatic mode of production’ before giving up on this somewhat colonial characterisation altogether towards the end of his life. One of the main strengths of the book is its ability to draw out political lessons from the experience of the Russian Revolution. When discussing the February revolution which overthrew the Tsarist regime, Faulkner discusses the idea of leadership, and highlights the fact that the revolutionaries (including the Bolsheviks) were behind the curve of the women textile workers who marched from the Vyborg district on International Women’s Day, demanding bread and calling on neighbouring factories to strike. The book states that the ‘spontaneous’ nature of the uprising does not mean that it did not have leadership on the ground. In fact, many of the leaders of the revolution were schooled in the politics of the revolutionaries, particularly the Bolsheviks. However, the organisation in this instance lagged behind the class and had to catch up. The book gives day by day accounts of the February revolution showing how the seemingly all powerful repressive apparatus of the Tsarist state began to crumble as conscripted soldiers from a peasant background began to refuse to shoot on workers. The difference between the ideology and practice of the police and soldiers is highlighted; the police was a ‘hardened caste’ who’s work consisted in ‘hostile collisions with activists, workers and the poor’ (116), and therefore did not support the revolution. The soldiers, sick of war, facing their own people, eventually did come over to the revolution. As Faulkner points out ‘a minority ruling class cannot rule without armed force’ (121). Tsarism was over. What would replace it is the story of the October revolution. The workers Soviet (council in Russian) that had been set up in the 1905 revolution in Petrograd, re-emerged in the February revolution of 1917, and spread across the country. It involved workers, soldiers and peasants. The book is effective in showing that the October revolution was a ‘mass movement’ of ‘participatory democracy’, rather than the Bolshevik coup that mainstream, as well as some left-wing accounts portray it as. The movement combined workers strikes, riots and protests, the movement for the land of 100 million villages, and the ‘biggest military mutiny in history – a movement of 10 million soldiers’ (180). Faulkner details the Soviets going over to Bolshevism in September, voting one after another for a Soviet system of government. This is essentially a vote for a second revolution. The reader gets the sense of a revolution as a process in which one part (an essential part) is the insurrection, the actual seizing of power through arms. The Bolsheviks as a network of militants is seen as central to the success of the October revolution while the common misconception that the revolution itself was a coup is dismissed. If the Bolsheviks did organise a narrow coup, their actions during the ‘July Days’ are inexplicable. Why would the organisation attempt to hold back the most militant workers from having armed demonstrations if all they sought was military advantage? The action damaged their credibility, yet they were adamant that the rest of the country had to catch up to this level of militancy if the revolution was to be successful. As an introduction and guide for activists to the events of the Russian Revolution the book largely succeeds. It is weaker as an intervention into debates around Leninism. Faulkner sets out to show that V.I. Lenin was not a ‘democratic centralist’. However this term is not defined, as it seems to be assumed that the reader will know what it means. The term simply means that decisions are to be debated, democratically voted on, and are to be implemented by the whole organisation or party. In this sense, too much mystique has been heaped on the term by supporters and opponents of it alike. Many working-class organisations operate on this basis. For example, when a strike vote is taken, all members of a union are expected to respect a picket line regardless of their personal vote. The debate seems to be about the exact balance between centralism and democracy, something which shifted depending on the context in Lenin’s career. Part of Lenin’s criticism of the soon to be Menshevik Julius Martov was that those at the top of the organisation should be held accountable to conference decisions. Is this a case of defending democracy or centralism? The two poles are not always easily counter-posed. Similarly, the term ‘vanguard’, which is not clearly defined, is used with negative connotations related to political sects. The two differing uses of the term, meaning both an advanced section of a class, and an organisation of revolutionaries, is not brought out. One of the dividing lines between the Mensheviks and Bolsheviks was whether one aims to organise the whole class, or whether one aims to organise the advanced section outside of a revolutionary situation. The original split came to a head when Lenin proposed to reduce the editorial board of Iskra to three rather than six. The membership question is important but not the whole story. Faulkner supports Lars Lih’s premise that Lenin and the Bolsheviks were trying to replicate the German Social Democratic Party (SPD) under Russian conditions of greater repression until 1914, and to some extent up till 1917. While this is what Lenin understood he was doing up until 1914 there are differences in practice that would only be theorised after the fact. Lenin not only split from the ‘ultra-left’ Bolsheviks in 1909 but then went on to exclude those (predominately Mensheviks) that wanted to liquate underground organisation and focus exclusively on legal work. Lenin essentially declared the Bolshevik faction the Social Democratic Workers Party of Russia in 1912. The SPD contained openly reformist elements around Eduard Bernstein, the so-called ‘Marxist centre’ of Karl Kautsky, and revolutionaries around Rosa Luxemburg and Karl Liebknecht. After the SPD and most parties in the Second International supported their own governments in the First World War, Lenin attempted to explain this through the concept of the ‘labour aristocracy’ in Imperialist countries, and the ‘peaceful’ year in which SPD developed reformist practices. Of course, after 1917, Lenin would argue for the specifically Bolshevik model of organisation in Left-wing Communism: An infantile disorder and the Communist International. The overall impression the reader gets from the book is that as a high point of struggle, maybe the highest, the Russian Revolution has many lessons for activists today. We will continue to debate the detail of what these lessons are.